Lamborghini Centenario, Ferrari LaFerrari, Rolls Royce Wraith Mansory in Knightbridge. Which one would you have? I've seen so many pictures of this car on here and Instagram and Autogespot and you name it, but anyway this is better than all those shots in my honest opinion. Great combo and shot, L/F for sure!! @VolvoMan05: I'm just trying to bring some humor on this site. Anyways did anyone notice how the Centinario's tail lights looks similar to the Asterion concept? 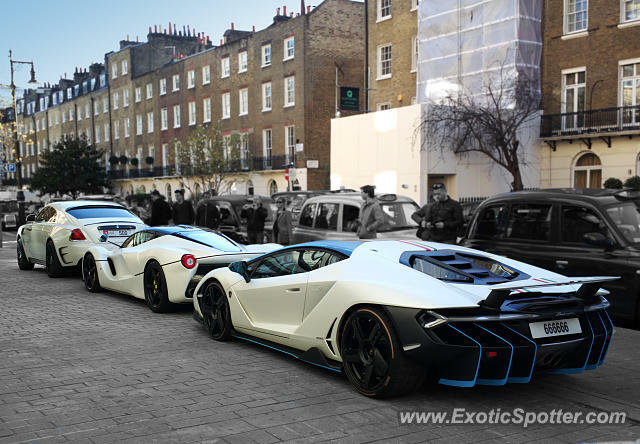 Could this be the spot of the "Centenario"? hahaha awesome combo! @Texascar: The owner of the Laferrari, and the Centenario is a member of the Qatari royal family. What an amazing group of cars! I would take all three of them :) L/F from me! 19/19, can't break the chain!